A member of the Acanthuridae family, the Achilles Tang is a gorgeous surgeonfish that requires a great deal of attention and care; in fact, it is usually kept only by expert aquarists with a good deal of fishkeeping experience. When first introduced they can be a bit touchy and should be quarantined for a few weeks to be sure they are eating well and adjusted to your reef keeping habits before being introduced into your main display tank. Once settled into your system, they are hardy, active, and very attractive fish. Achilles Tang fish are highly susceptible to contracting ich and can have problems with HLLE. It can be aggressive towards other surgeonfishes, especially those of its own kind. Large adult specimens in particular fight terribly if not given plenty of space to keep them apart. Unless you're able to provide a very large system with more than ample room to swim around and plenty of places to hide, this fish is best kept singly. Achilles Tangs are found in the waters of the Western Pacific near the islands of Oceania as well as the Pitcairn and Hawaiian Islands. They also inhabit reefs surrounding the Wake, Marcus, and Mariana islands, and have been found in the Eastern Central Pacific near Baja California and Mexico. They generally swim among the coral reefs, in the area called the surge zone; this is the area where waves break over the reefs, creating currents and oxygenating the water. The Achilles Tang is a dark brown or purplish fish with bright areas of orange and white around its fins and gill covers. It also sports a bright orange teardrop-shaped mark near the caudal fin (this mark starts out as a streak in young Achilles Tang, but changes shape over time). The Achilles Tang can be quite aggressive toward others of their species and toward other surgeonfish. It's, therefore, best to keep only one in a tank. They can, however, interact peacefully with other small, peaceful fish. The trick, however, is to provide an appropriate environment for the Tang with fast-moving water while also providing a healthy setting for the smaller fish that more typically prefer only a moderate current. Because Achilles Tangs are so delicate, it's usually best to put their needs first. The Achilles Tang requires lots of room to swim around, and plenty of places to hide. A constant grazer, this fish is best kept in a well-established aquarium with a hardy growth of marine algae to graze on at its leisure. In the wild, the Achilles Tang greatly prefers the highly oxygenated waters of the surge zones in and around the reef with plenty of holes and caves to retreat to when it feels threatened. The Achilles Tang is an herbivore and can be very picky about its food. It prefers micro and macroalgae but can be fed frozen and dried marine algae and spirulina. They may also be willing to eat vegetables such as broccoli, zucchini, and dried seaweed. They should be fed three times a day. There is no obvious visual difference between the male and female Achilles Tang. It is almost impossible to breed the Achilles Tang in a private aquarium. In the wild, it spawns in groups; the female ejects a "cloud" of eggs, and the male swims through the cloud fertilizing the eggs. Later, the fertile eggs float to the surface of the water. After they are born, the larvae can feed on surface plankton. Finally, the larvae develop into juveniles that make their way to the reef where they live out the remainder of their lives. 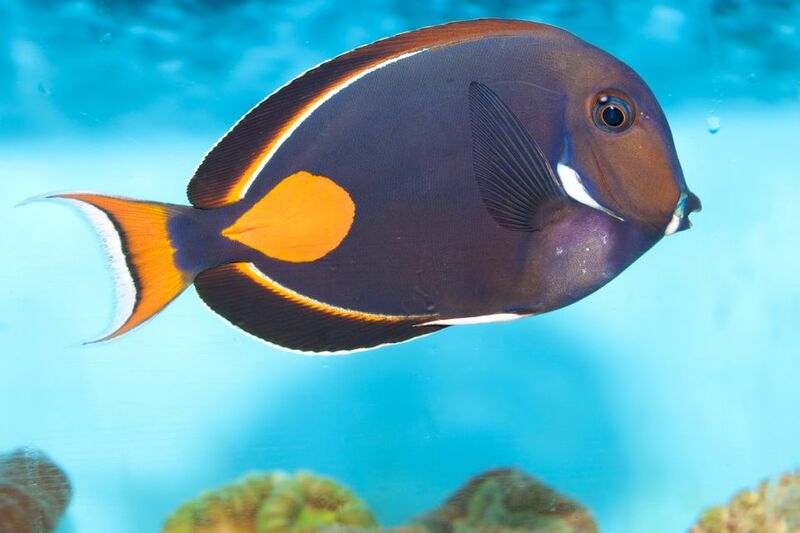 The Achilles Tang is one of the most challenging fish available to aquarium keepers. It is sensitive to ammonia poisoning, is an extremely difficult species to handle, and therefore should only be kept by an experienced aquarist. This a fish that seems to break out with ich at the slightest provocation. The Achilles Tang can be a picky eater, and may not readily accept foods offered. For this reason, and because they seem to have gotten rare and hard to find, it is best to ask to see this fish eating before you buy one. As with any Surgeonfish, the Achilles Tang comes equipped with a pair of very deadly "spurs" which can inflict a serious wound, not only to a distracted aquarist but also to other fish in an aquarium. Professionals who collect Achilles Tang in the wild actually clip the tips of the spurs with a pair of nail clippers to keep the fish from damaging collectors or each other.